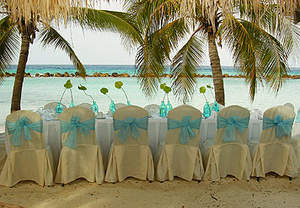 Kelly and John / Aruba wedding video / Radisson Resort / 2013 from RealPix Media on Vimeo. A wooden airplane to hold the rings for a ring pillow, doubled as a toy at the reception. EAGLE BEACH, Aruba February 4th, 2014– U.S. News & World Report, a multi-platform, publisher of news and information, has awarded Bucuti & Tara Beach Resorts the coveted number one ranking hotel among 78 hotels in Aruba. U.S. News travel rankings are based on an unbiased analysis of awards, expert recommendations and user ratings. Also noted was that travelers consistently praised the guest room views of Eagle Beach and the relaxing, adults-only tranquil environment provided by the resort. In addition, TripAdvisor has announced the winners of the 2014 Travelers’ Choice hotel awards, which identifies the world’s top properties, and Bucuti & Tara Beach Resorts is pleased to be honored among the top 25 hotels in the Caribbean, the only resort in Aruba to receive this distinction. Additionally, the resort was named among the top hotels for romance in the Caribbean category, again the only resort in Aruba to receive this distinction. TripAdvisor Travelers’ Choice winners are based on millions of valuable reviews and opinions from travelers around the world.